Oh dear, it isn't getting any warmer is it? Come on Spring, get a move on! 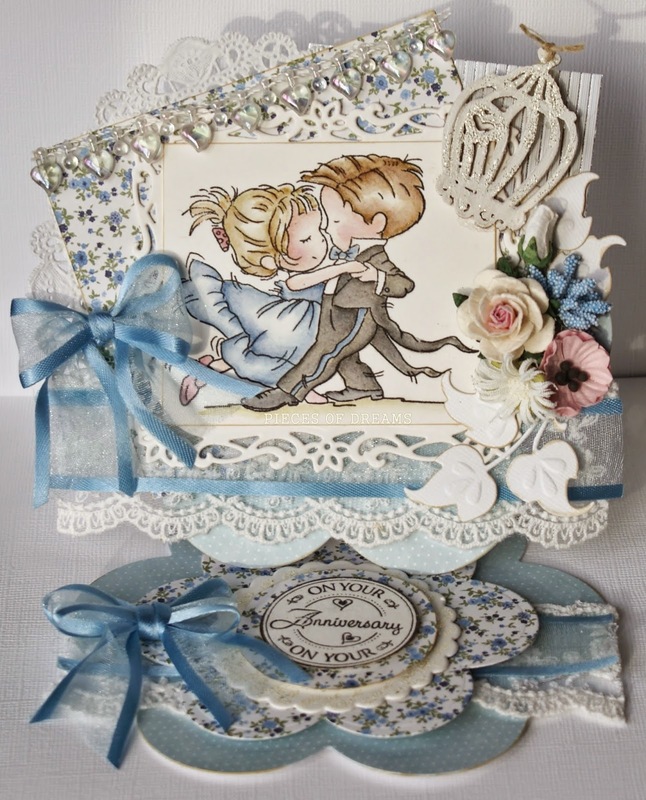 This is a card using the uber cute, Stop in the Name of Love Tilda. My new Spellbinders machine arrived at the weekend so I will be able to use my X lge Go Kreate dies again. Meanwhile, I have another made up easel card to share. 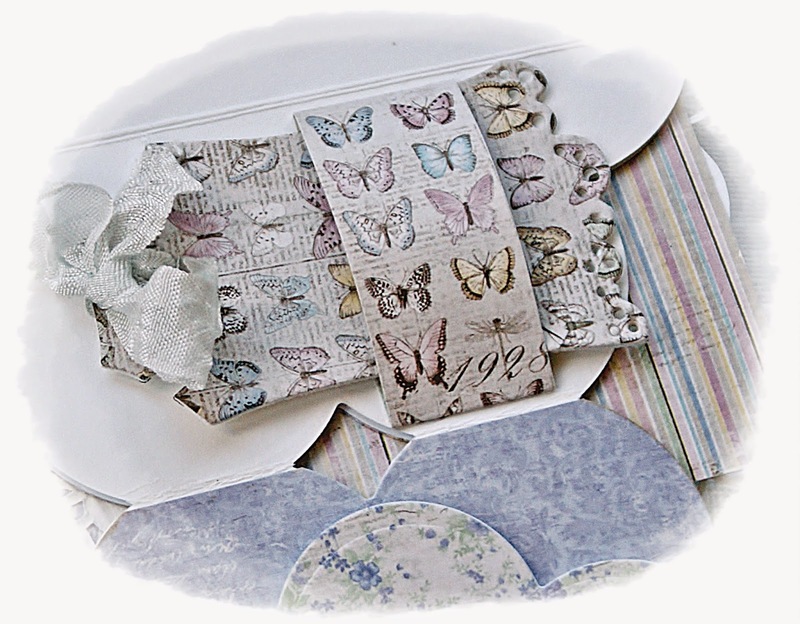 The papers are Maja Spring Basics and the sentiment stamps come from Lili of the Valley. Dies are Spellbinder and Joy Craft. 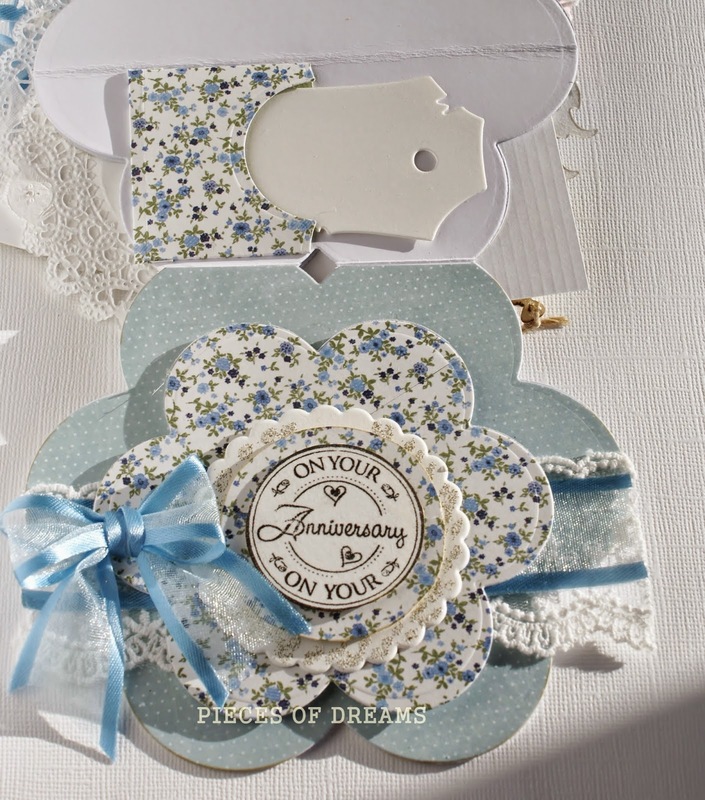 Lace and ribbon can be found at Live and Love Crafts. 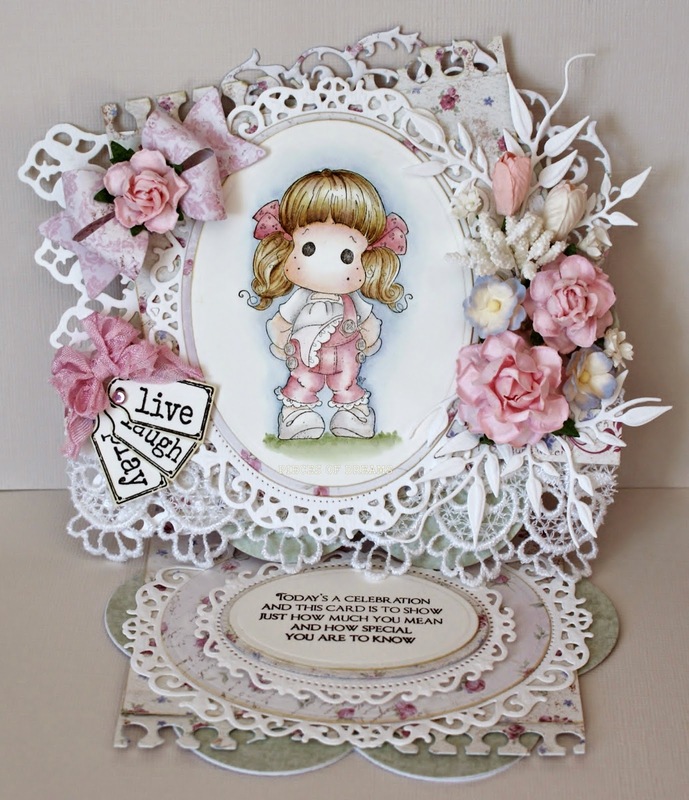 She has been coloured with distress inks onto watercolour paper and has a little glamour dust on her lace. I have made a tag which is hidden in the fold. And this is a view of the card base. Sorry if this post is picture heavy, but it's hard to take a picture of the complete card. Take care and wrap up warm if you go outside. Brr, it's so cold outside today! No snow forecast for the London area but plenty has fallen elsewhere in Britain. 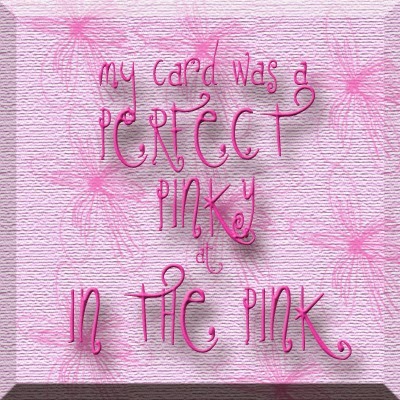 I am staying nice and warm in my craft room making cards. Lovely! Apologies for the dark picture, I just can't seem to get a good light at the moment. Time of year I suppose. 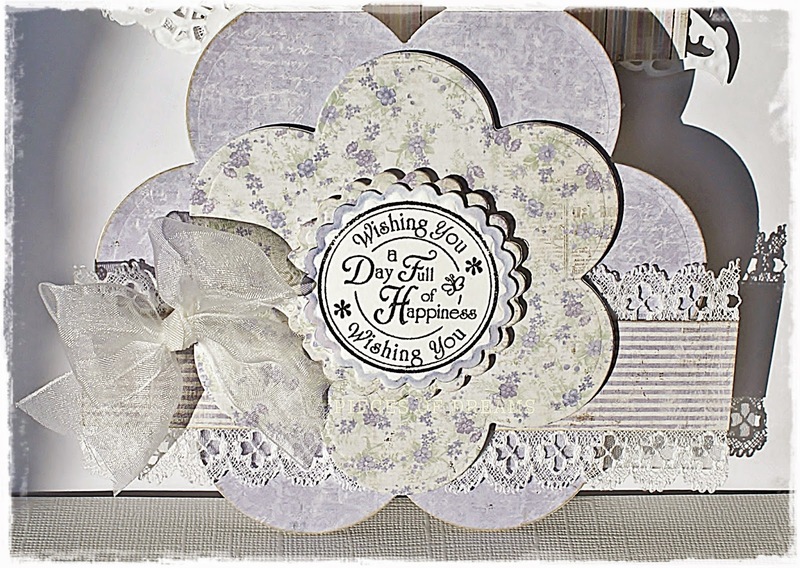 The papers are Maja Design on white Bazzill basic card. The frame is Spellbinder and the banner is La La Land dies. Flowers and Rose Ribbon available at the Ribbon Girl. The tag stamps are also from Lili of the Valley. 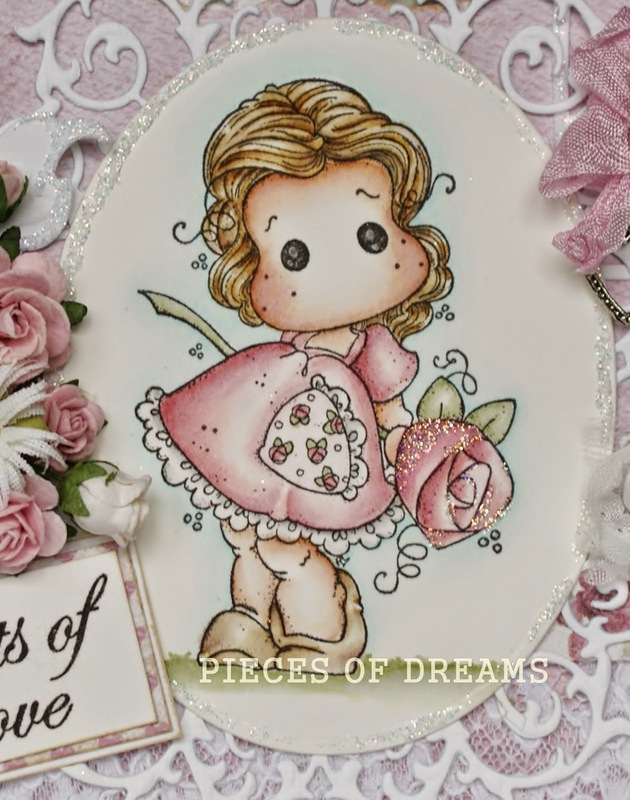 This little cutie pie has been coloured with distress re-inkers onto Langton watercolour paper with Stardust Stickles on the accents. She is my favourite stamp for the moment. So, that's all for now. Take care and happy Crafting! It's been about a year since I started my blog and received bottles of distress re-inkers from Santa. I have been using them ever since and the bottle seem to last forever. My Copics come out now and then but I really love the effect of my inks. I still struggle to get the technique right but on the whole I am happy with my progress. Slow and steady is the word and practice. Lots of it with lots of patience. I'm still waiting for my new Valentine Magnolias to pop through the door, so I have used Tilda with Big Rose and made a totally pink, girly extravaganza! The papers are Maja, Coffee in the Arbour, cut with Go Kreate Lge dies and inked to the edges. All the lace. flowers ribbon etc are Ribbon Girl Other dies are Marianne and Joy Craft. I added a little heart charm secured to Shabby seam binding with a brad. A scattering of Glamour Dust and she is ready for Edwin. 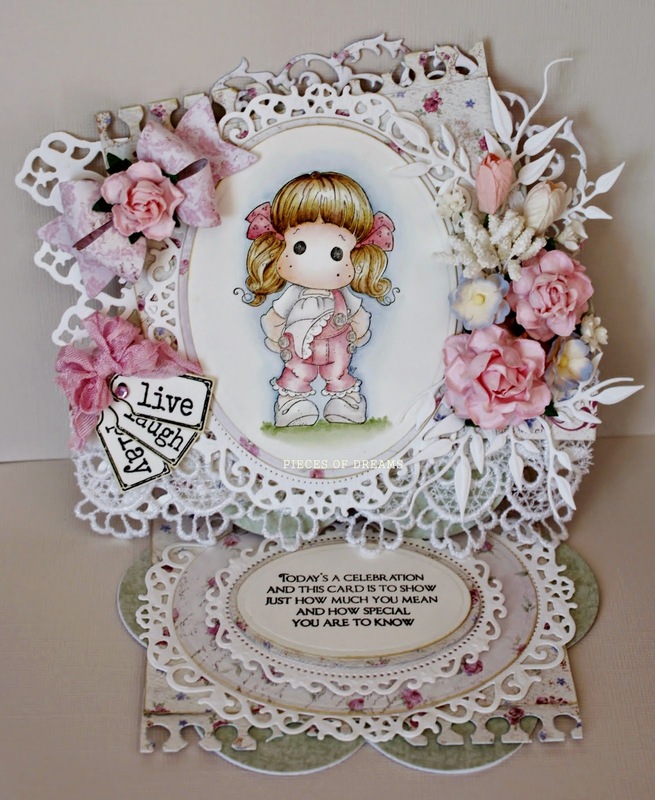 Tilda's Town is a most magical shop specializing in Magnolia Stamps & Cutting dies. We carry over 1,400 stamps in stock at all times & over 4,000 dies from all your favorite brands. We offer very competitive shipping rates and we ship worldwide. Visit us at Tilda's Town and live the magic. Thank you so much for your lovely comments, they mean so much to me. I hope you will join us over at Tildas Town this week. I really enjoy visiting your blogs. It's a cold and windy day here in London and so dark and miserable. 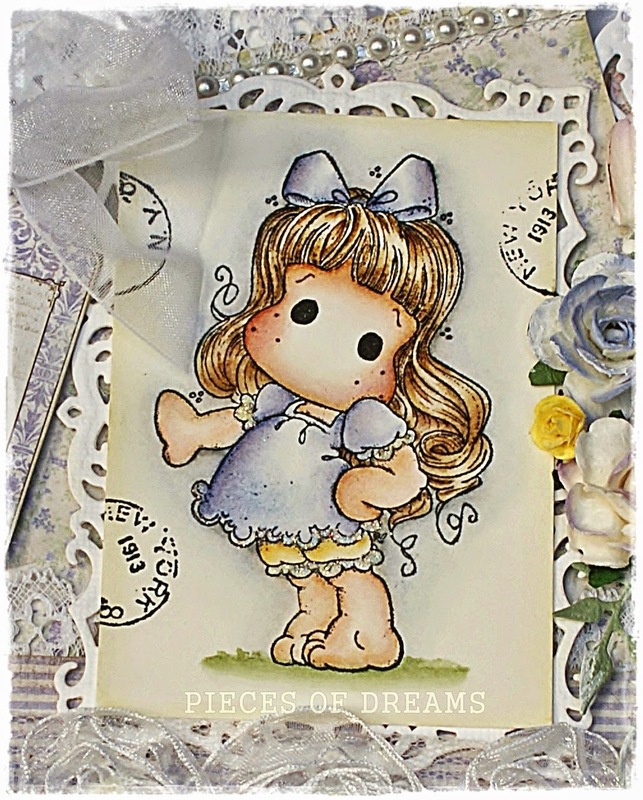 So, I thought I would try and cheer us up with a Lili Of The Valley card made with the oh so cute "Tango" stamp. For all the Strictly fans out there, I give this stamp a "seven!" 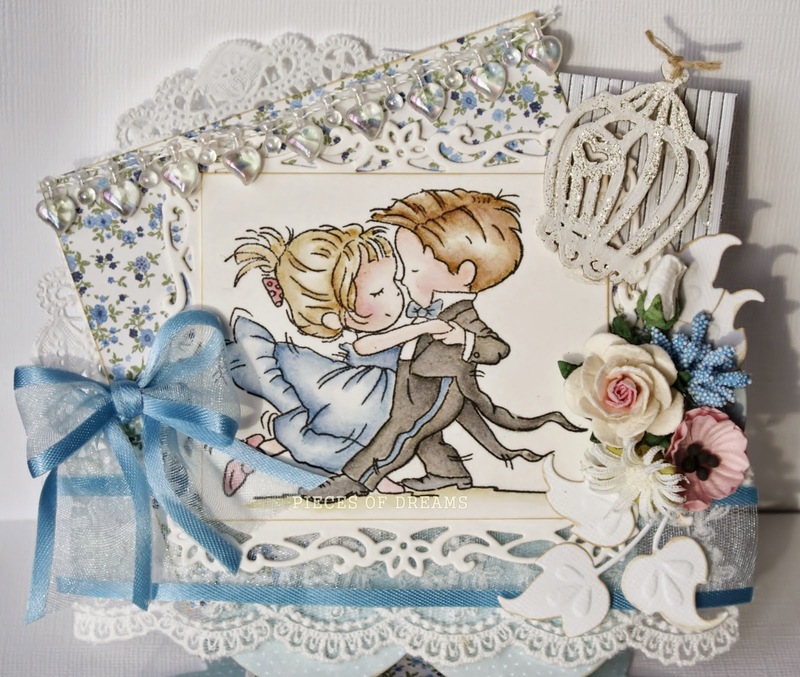 I have used distress re-inkers to colour the couple onto Langton watercolour paper. The ribbon, lace and flowers can be found at The Ribbon Girl. 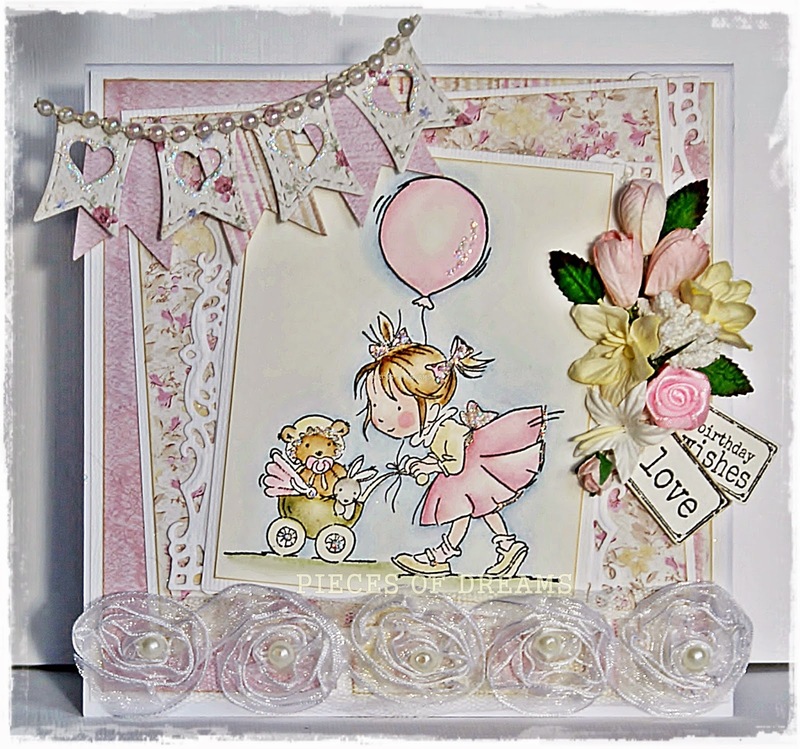 I had such fun making this card and used quite a few dies. The main card uses Go Kreate Flower#1,( new from Santa), the leaves Marianne and the circles and image background are all Spellbinder dies. 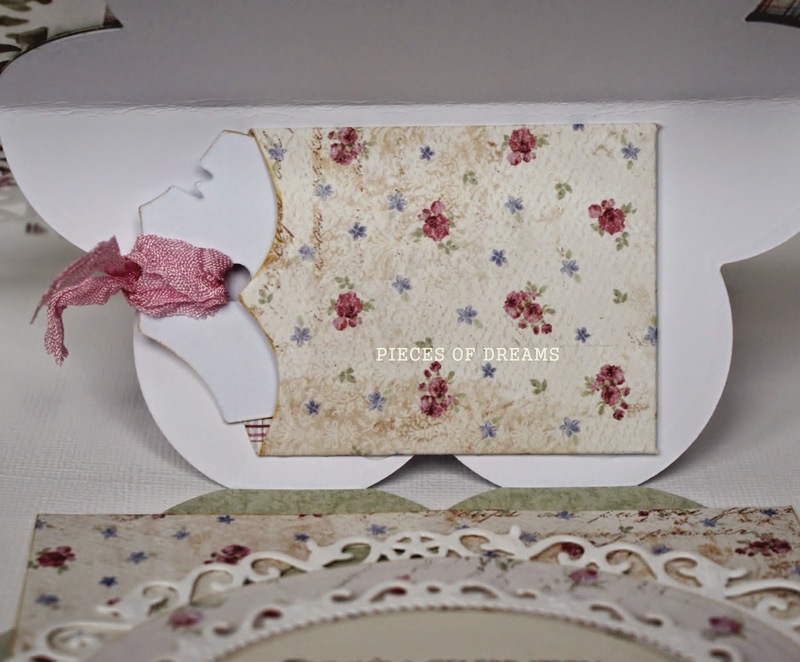 The wooden birdcage has been Frantage embossed and across the paper is heart stringing with a doily tucked behind it. A secret pocket in the card fold holds the tag. The sentiment is also a Lili of the Valley stamp. So there is my Anniversary card. I hope you like it. I hope you had a lovely Christmas and wish you the best 2015. I had a bit of a disaster just before Christmas when the handle snapped on my Grand Calibur machine, so I am using the Big Shot at the moment. It means I can't use my big Go Kreate card dies until I receive a replacement and I love making shaped cards. So I decided to try my hand at creating a shaped easel card for you. It's a first for me so I hope you like it. 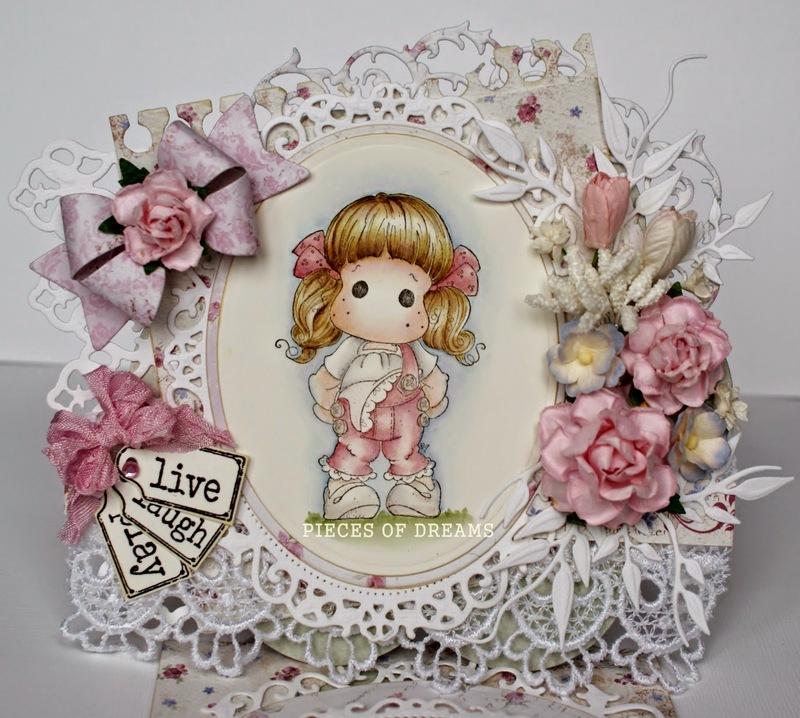 I decided to use Tilda in Summer Pants, and added lots of dies including the DooHickey, Bride Bow. The branch die, fancy oval die(at back) and Notebook die are all Joy craft dies from Noor Design. 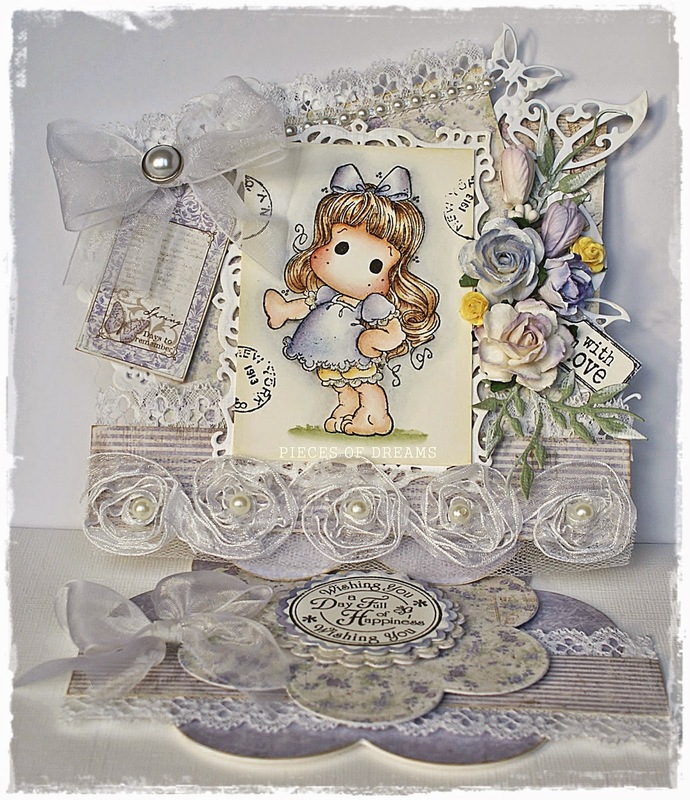 The wide border die and image dies are Spellbinder, Papers are my favourite Maja Design and all the lace, ribbon and embellishments can be found at the Ribbon Girl. Flowers are also Ribbon Girl and Wild Orchid Craft. Sentiments are all stamps from Lili of the Valley. 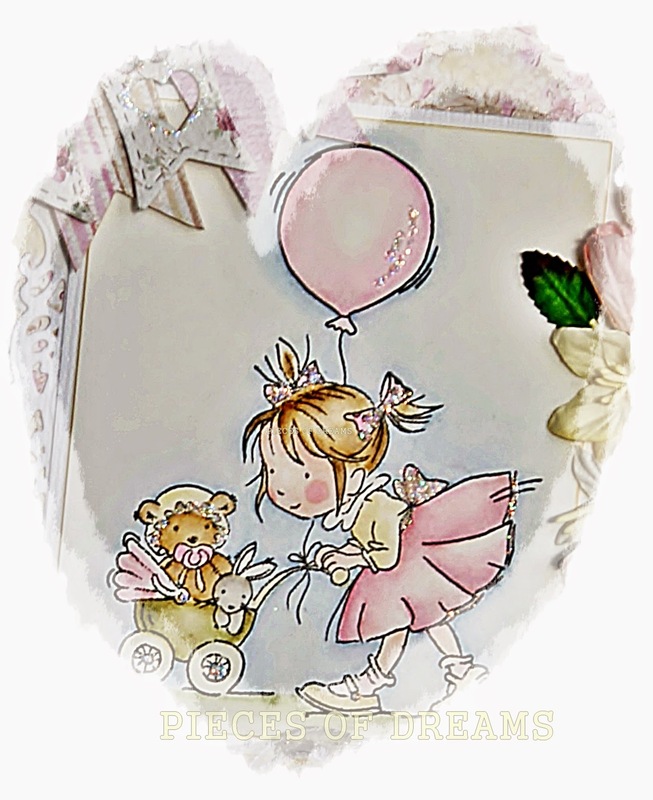 Tilda was coloured using Distress re-inkers onto Langton watercolour paper. I apologise for the not so sharp picture. The light is really bad here today. The message tag sits in a hidden pocket in the easel. I look forward to visiting your blogs to see your "Happy Everything" cards. 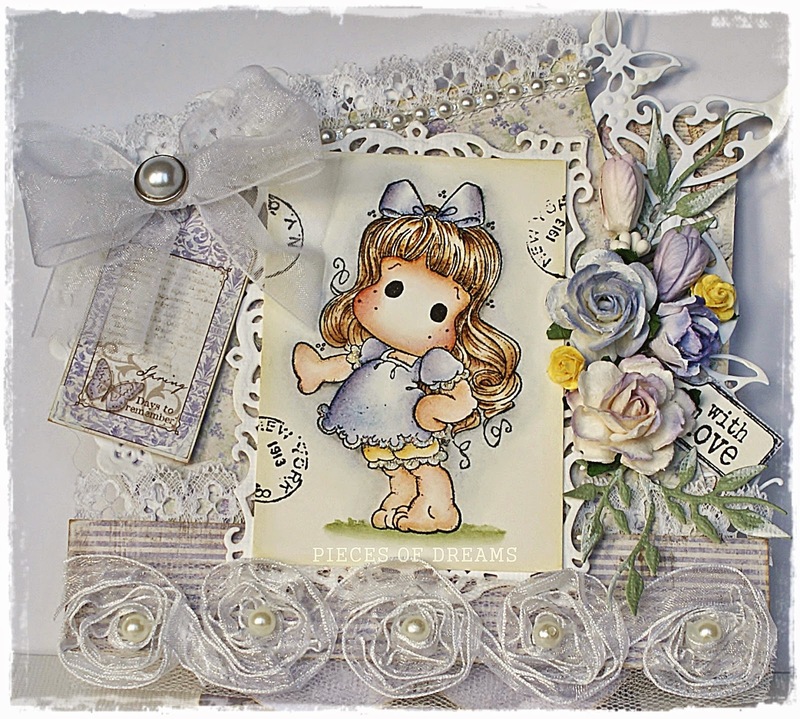 "Tilda's Town is a most magical shop specializing in Magnolia Stamps & Cutting dies. We carry over 1,400 stamps in stock at all times & over 4,000 dies from all your favorite brands. We offer very competitive shipping rates and we ship worldwide. Visit us at Tilda's Town and live the magic."